$11. | there's no place like gnome. These lamps? $1. Can you believe no one else wanted these beauts? You can? Okay. Sure. 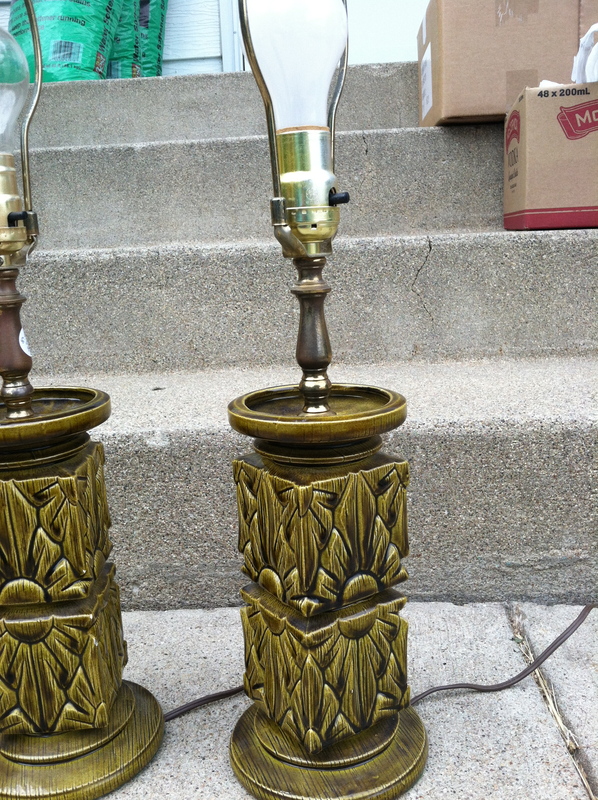 But with a new lamp shade and a coat of spray paint, these will be awesome. Mark my word. 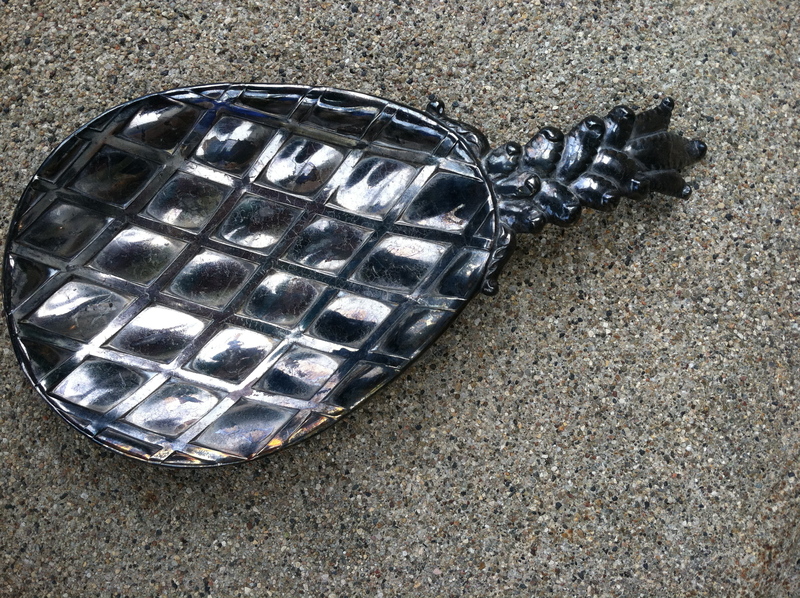 A pineapple spoon rest to sit on my stove and hold my cooking utensils! This piece was free. It came in a box of things Marilyn bought and she let me have it. Score. It goes with my pear and apple curtain. Okay. This dresser needs a little TLC but I’m always looking for a project. And … it was free. 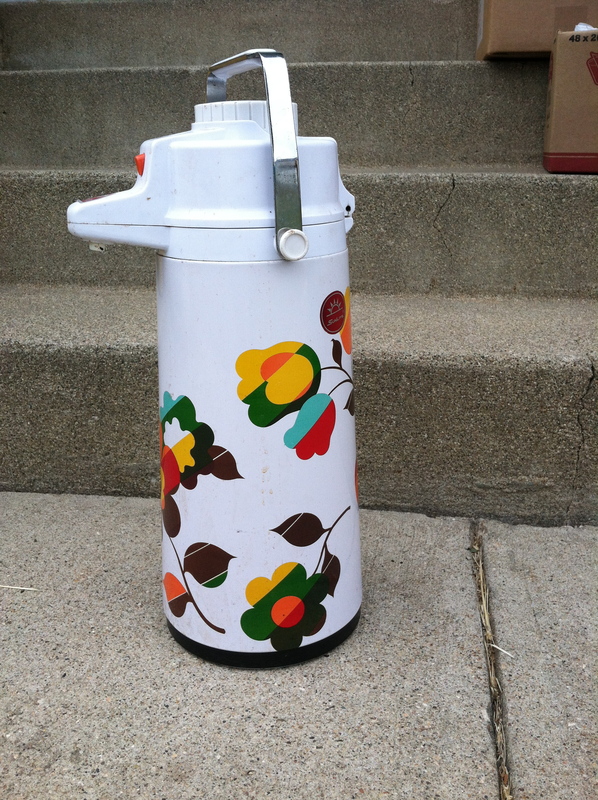 No one bid on it and so it was taken to my garage where I vowed to make it useful again. And I will. [And if I completely mess it up? I’m not out anything.] It will be perfect in my guest room when complete. 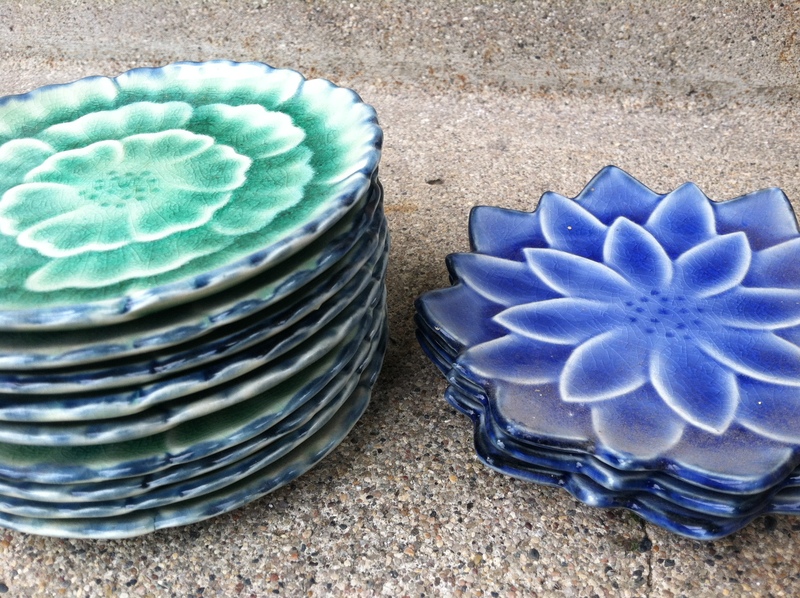 Little plates/candle holders/something. I thought they were cute. According to the price tag on the bottom of some, they are old school Pier 1. This little puppy salt shaker came in the box with the little plates. She might meet the dumpster. Or a random package to my sister. They’re not Pyrex but they sure are cute. 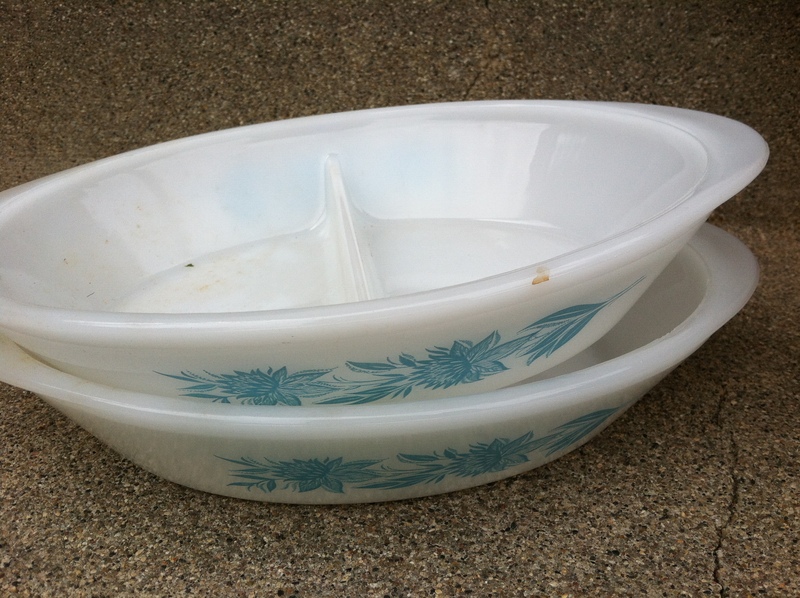 Two divided dishes. $1 for both [and another one that I think is rather ugly]. 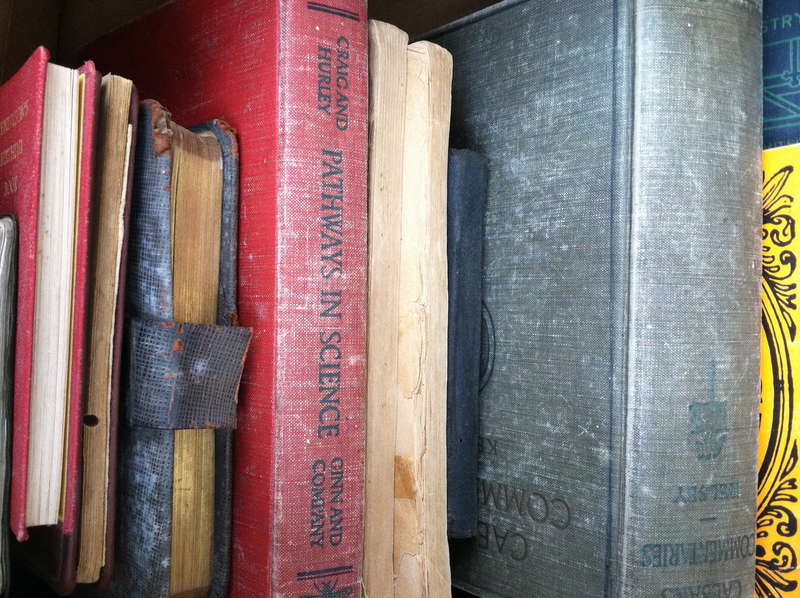 A box of old books cost me a couple dollars but there are treasures in there. Catechisms in Norwegian, a line-a-day journal from 1924 that its original owner filled out sparingly [February 1927: Ma papered her room. ], and some other fun/unique treasures. That isn’t the full list. There were some other things that came boxed with the treasures above … a few things that might go away and a few things that I might find use for. Marilyn gave me some old glass insulators that came with one of her purchases. We’ll have to see what we can make with those. 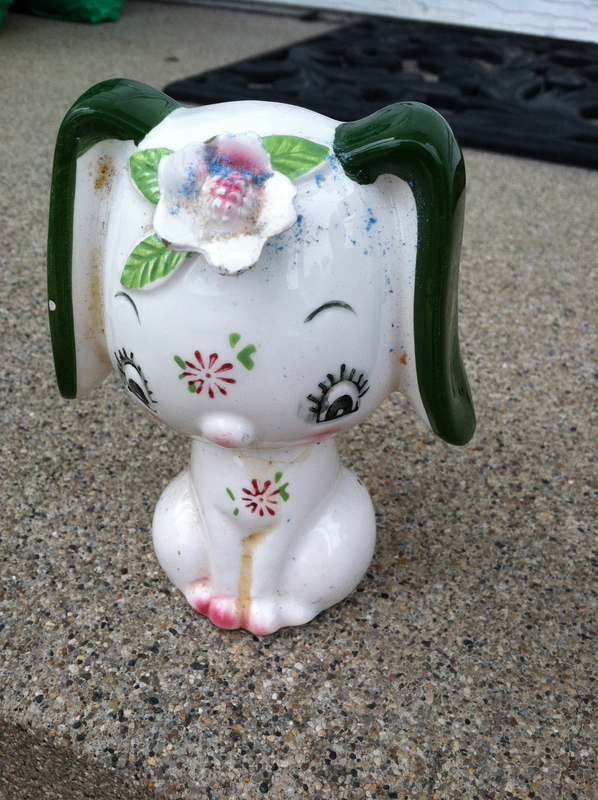 An old perfume bottle. Gravy boat. Funky wooden bookends. Etc. Etc. The fact that I only spent $11 on these treasures is good for me … but not good for the church. Our auction crowd was small so many things were snatched up way too cheap. But so it goes. While it was a lot of work, it was a fun time to gather. And buy some ugly lamps with potential.